It’s Christmas time for Petey & Polly Penguin! It’s our brand new Petey Penguin Collection! They may look slightly familiar; however they are brand new with a new face, a lot more animated and cute little names! Petey & Polly get ready for Christmas as their 2 tots dance with excitement. As is the case with all of our ornaments, it is very detailed. 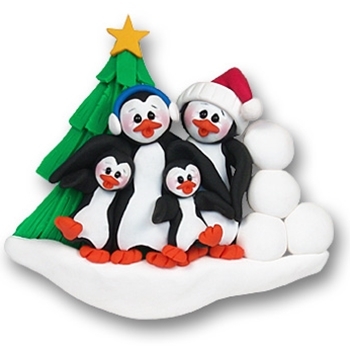 This ornament makes a great personalized gift & ornament for a family of 4. Handmade from polymer clay and designed by Debi Allison. It comes complete with a hook and satin ribbon for hanging. Watch out! There may be a snowball fight!